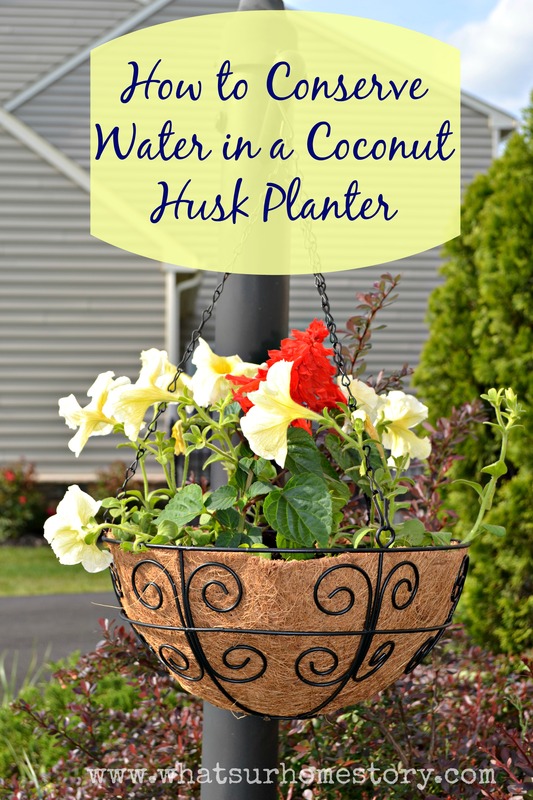 Have you noticed planters with coconut husk hanging basket liners in every garden center? Ever used them? I have. Last summer…..bought a coco lined hanging planter from Big Lots for $4.99. Planted red and white petunias and hung it on the lamp post rod outside. Don’t they look gorgeous? Sorry don’t have a zoomed out shot (pre-blog days). Now for the not so pleasant part, the one that is not really touted about much by the so called coco husk planter sellers. These are a pain in the …….you know where to maintain. All the water and fertilizer that you pour, just drains out in a few seconds. I had to water it twice a day even when the sprinklers were on! By the time I would come back from work they would all be wilted and sad looking needing a drink. Second problem: The iron outer shell, especially the hanging chains (in my case it was the latter) rusts with the constant watering. The only plus (realized it thanks to Google), you can re-use the coco liner if it hasn’t rotted. Didn’t know about this last fall when I brought the planter inside and thrashed the liner. With then recent warm weather it was time to bring back some lamp post action. But had to deal with the rust issues first. See what I mean…..the chain? Enter a can of Krylon paint + primer in satin black from Walmart for $4.99 and a cardboard box. Some paint TLC (thin even coats) later it was as good as new. A new liner from Big Lots for $2.99 and some petunias and red salvias from Home Depot for $0.69 each, we were looking at a new lease of life for Mr. Rusty. Still….needed to solve problem #2. After some Googling found a great solution, trash bags! Ya, you heard it right trash bags. Use your coco liner as a template and trace a circle on your trash bag. Cut out a circle an inch or two larger than your liner outline. You will end up with two circles from each side of the trash bag. Poke some holes all over with your scissors and line your coco liner. I just layered one piece over the other. Always arrange your plants in the planter first, to figure out the right arrangement. Saves you the hassle of changing things once the dirt is in. Fill in your soil, give a good soak of water, and you are all set. In a few weeks the plants will fill in the container. Have you used these hanging basket liners in planters before? Did you run into the same issues? Believe it or not, I line my cocoa fiber planters with a disposable diaper. There’re beads that absorb and hold water. You can poke a few holes in the diaper to allow excess water to drain. The diaper holds moister in longer. I was wondering if that worked, I may try that next year! It’s easier to lay the trash bag in the coco liner and plant as normal. Give the plants a little drink and let the soil settle. THEN TRIM the bag down to the level of the soil. Poke one or two small holes about an inch or inch and a half up the side. (not directly in the bottom). Works wonderfully!! Using burlap as the liner works well and seems to stay moist longer. i’ve used them for a few years…next year, i think i will try cardboard as a liner as when they start to disintegrate, they have nutrients released (Or so i’ve been told….). also. as you soak them like crazy before you plant for the year, i thought i’d try outside watering…with other plants underneath that are light enough to carry when watered…so that the water dripping down doesn’t all go to waste….THEN i water..on mist…slowwww mist…the plant itself inside. this seems to be working pretty well…at least much better than the last years…..i’m afraid of what they use in plastics..and i KNOW what they use in diapers to make them super absorbent….not going to leach into my plants. in some past years,when i had a prolific year of moss, i would line the inside of them (rather than moss itself)…but moss hasn’t been such an abundance these last few years…..thus the other things i’ve tried. i’ll be watching this in the future to see what other tips!! curious though…home depot dropped the price by $2. from last year for the cocoa linerS??! Cardboard is great idea Tara. I’ll try that next year. This post is a couple of years old. I think those liners are cheaper now. I recommend keeping old liners for the birds as a sacrifice, in early spring, as they will shred ur baskets, put them out before u plant and in the fall. That’s a great idea Marianne. I always use them as pot saucers but never thought about using them inside the cocoa liners. I use my small dog’s we-we pads. I use the plastic noodles that come in packaging. They hold moisture and leave too much water to drain. Work great. I use a plastic drain dish in the bottom. Have you ever used those crystals from the dollar store that are used in vases to hold flowers or candles? They work really well in planters because they hold and grow bigger with the water and then gradually release as they dry out. I think they are just a gelatin base so I don’t think they are toxic, at least my planters didn’t need watering as often and plants grew really well! I see some plant pot mixes now have the water holding options now too. Another suggestion I’ve seen is to plant a bottle with small holes into the planter then water into the bottle to slowly release as needed. Wow Carla, I never thought of that. Yes they would be a good option as they hold a lot of water. Will have to try. Thank you! I experienced the same concerns with the coco liner and the rusty chain. Thank you for the solution. I was ready to give up on hanging baskets. I do have a question. In my search for a solution, I came across The idea of using a disposable diaper instead of the plastic trash bag and what to ask if the diaper a better solution than the trash liner? I was wearing myself out like you mentioned with the watering before I went to work and watering a again after barely pulling in the driveway upon returning from work and the plants were still wiltering and dying. I’ve had a few friends try the diaper option and they swear by it. I think it might be better than the trash bag as they hold water better.